It was my first time making a pie. All apple crumb recipes that I had seen before were pretty much the same. I had never tasted a pie with this specific mix and was wondering how they would blend. The first bite is always the scary one because you don’t know whether you’ve done a decent job or not. For me, it was even more scary because I was going to take my first experiment to a potluck party! Luckily, the sweetness of blueberries had blended perfectly with the juicy taste of sweet and tart apples and nutty flavor of almonds. All that’s missing in this picture is a scoop of ice-cream. My friend didn’t have any. I should have brought it with me. Oh well, next time. For this recipe, I used gluten-free flour and a pre-made pie crust but you can get the regular ones from any grocery stores or make the crust from scratch. I still need to work on making a gluten-free crust from scratch. 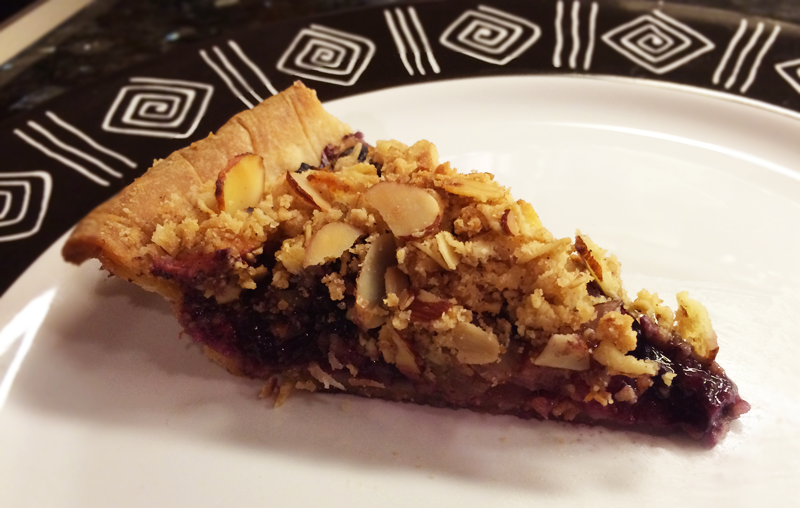 This entry was posted in Desserts, Family, Food, Gluten Free, Health, Life, Sweets, Uncategorized and tagged Almond, Apple Pie, blueberries, Desserts, Friends, Gluten Free, Pie, Potluck. Bookmark the permalink. ← For the Love of Spaghetti! Thank you! The almonds took it to a completely different level.